Audiobook available in CD, Playaway, and cassette formats through Recorded Books and as a digital download from Audible.com. In Jane Austen’s Persuasion, the Cobb—Lyme’s famous seawall—proved dangerous to a careless young woman. Now it proves deadly. Following their recent intrigue at Highbury, Fitzwilliam and Elizabeth Darcy visit the seaside village of Lyme on holiday. Family business also draws them there, to receive from a fellow officer the personal effects of Mr. Darcy’s late cousin, a naval lieutenant who died in action. Their retreat, however, turns tragic when they come upon a body lying at the base of the Cobb. The victim is Mrs. Clay, a woman with a scandalous past that left her with child—a child whose existence threatened the inheritance of one of her paramours and the reputation of another. Did she lose her balance and fall from the slippery breakwater, or was she pushed? Mrs. Clay’s death is not the only one that commands the Darcys’ attention. When Mr. Darcy discovers among his cousin’s possessions evidence that the young lieutenant’s death might have been murder, he allies with Captain Frederick Wentworth (hero of Persuasion) to probe details of a battle that took place across the sea . . . but was influenced by conspiracy much closer to home. The Matters at Mansfield (#4), The Intrigue at Highbury (#5), The Suspicion at Sanditon (#7). 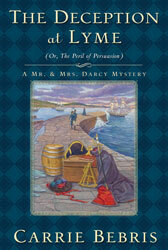 In The Deception at Lyme, Mr. & Mrs. Darcy find themselves investigating two suspicious deaths: one that occurred in the seaside resort of Lyme Regis, and another that took place on a naval warship. 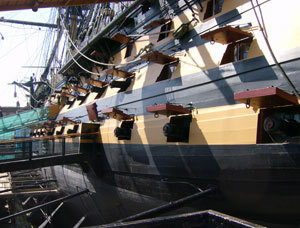 To capture the atmosphere and detail of these settings, research for the novel took me from the cliffs of Lyme to the hold of the Victory (Admiral Horatio Nelson's flagship from the Battle of Trafalgar). I loved every minute of it: standing on the most famous Royal Navy warship from the era in which Jane Austen's brothers and characters served, negotiating the steep, narrow streets of Lyme, walking on the same stones of the Cobb that Austen herself trod, hearing the cries of sea birds and the crash of the tide, feeling the spray of salt water, observing the gathering clouds of a rising storm—and imagining the Darcys, Captain Wentworth, Anne Elliot, and other characters experiencing that world. I hope that when you read The Deception at Lyme, you will feel as if you, too, are in Lyme Regis along with the Darcys. To help you on your way, I have created a visual tour of Lyme and the Cobb with photographs from my research trip. Bon Voyage!